I have a confession: I hate greens in my smoothies. I've never liked vegetable juice because I'd rather just eat my vegetables. My freezer is always stocked with frozen berries though, and the blueberries, raspberries, and strawberries are from our garden. I love spring and summer mornings when the windows are open and it's breezy and warm. The birds are chirping outside and it's the perfect welcome to the new day. Why not make a refreshing and healthy fruit smoothie? 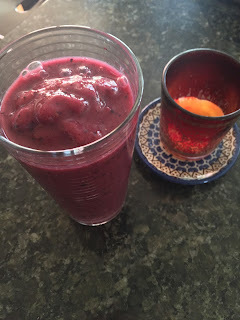 This [vegan] smoothie provides a welcome helping of fruit and an energy boost. Frozen fruit is great because you don't need ice and the consistency is nice and thick. Blend until smooth. Makes two servings.